"Smoky, spicy, and delicious chimichurri gives any grilled meat an amazing Argentinean flair." 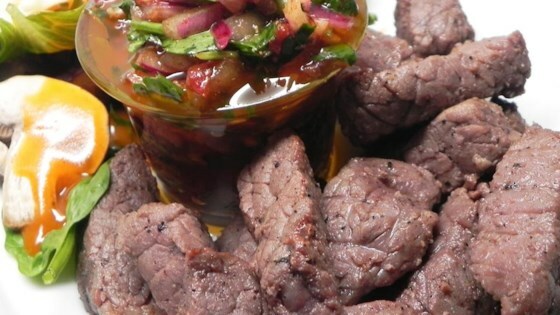 Toss beef tips with canola oil in a bowl; season with salt and pepper. Grill steak tips until they are beginning to firm but still slightly pink in the center, 2 to 3 minutes per side. Mix parsley, olive oil, red wine vinegar, red onion, garlic, chipotle peppers, paprika, and oregano together in a bowl; toss with grilled steak tips. First, the chimichurri was way too much in quantity. It tasted ok, but the end result was not enough to invest in the beef. No way I would make again. Simply delicious. My entire family added it to their favorite meal list. I will definitely serve this one again!!!!! holy freaking cow this was good! didn't alter/change anything. outstanding. thanks for sharing! !